Uliyanur Tevar temple a construction of Perum Tachan. This unique circular sanctum or Vatta Srikovil has 68 wooden beams converging on top. Uliyanur or the village of Uliyan is a riverine island like formation within the two distributaries of river Periyar, west of Aluva in Ernakulam district of Kerala. 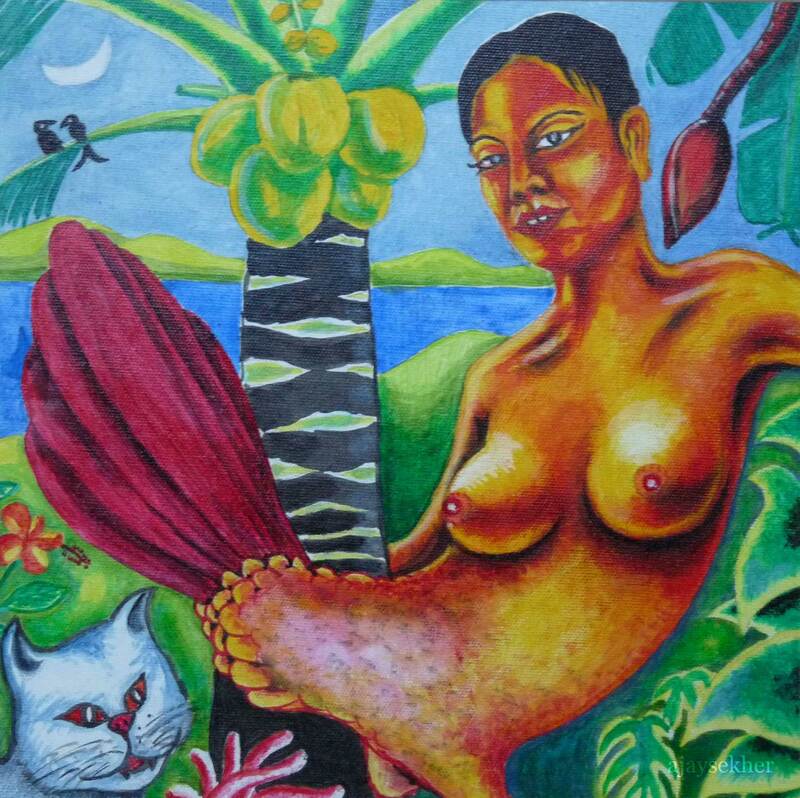 Uliyan or the chiseller is a denotation for the renowned carpenter in folk lore. The greatest chiseller and master architect in Kerala according to legend is Perum Tachan and he belongs to this village of Uliyanur. An ancient sacred grove or Kavu north of Uliyanur Tevar temple. Kavu or Kanyakavu is a relic of ancient Sangha Aramas or sacred groves associated with the Buddhist nun or Kanya Stree, also called Madhatil Amma in olden days. The sacred sword is still called Pally Wal. 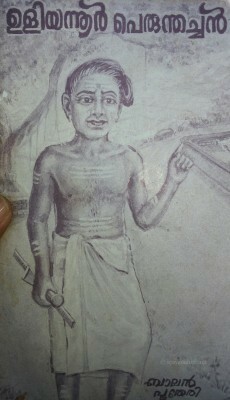 Popular lore has it that he was born in the Pantiru Kula clan of the primeval Paraya woman (Parayi Peta Pantirukulam). Kesari argues that he was an architect from west Asia and was the Thomas of Cana himself. Brahmanical legends fix Vararuchi the Vedic Brahman as his father. His relatives belong to the Perum Padanna family of Viswakarmas the traditional artisan community in Uliyanur. 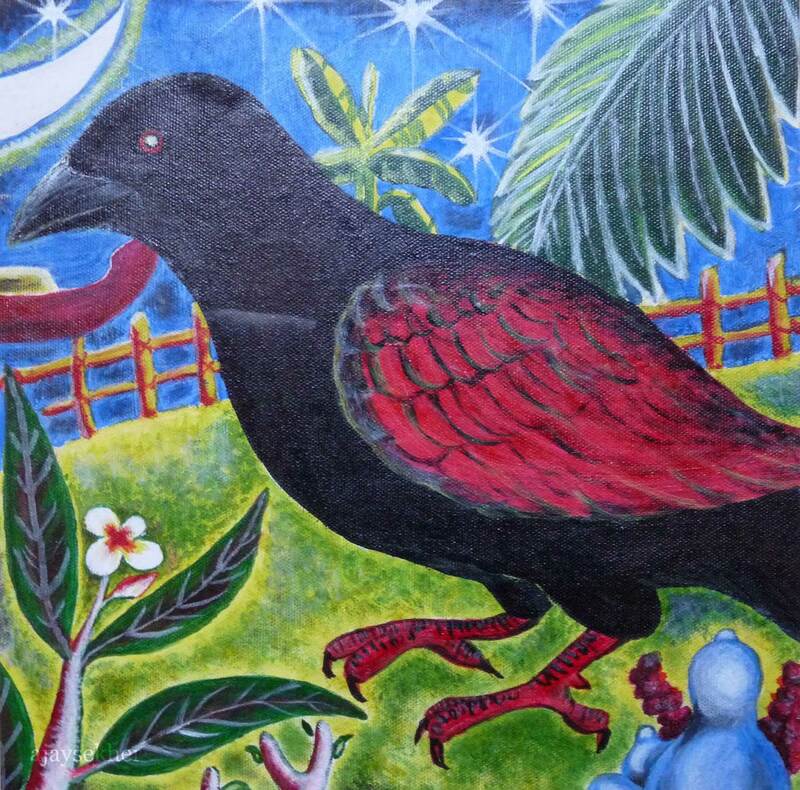 The eldest carpenter or Mootasari is given the title Perum Tachan in the family. Ayyappan Narayanan is the current Perum Tachan in Perum Padanna family in Uliyanur. Altar or Balikallu at Uliyanur Tevar temple. Lion and Elephant motifs along with human faces within Dragon facades on top are reminiscent of Buddhist architecture in Kerala. Padma Dala engravings are also on top. The Viswakarmas are traditionally called Kammala in Kerala. They make the Pallys, temples and traditional mansions. But once the deity is enshrined in a Hindu temple they are outcastes and untouchables in the exclusive Savarna Brahmanical sacred spaces. The etymology of the word Kammala is vital in understanding their history. Traditionally in tandem with the hegemonic Hindu commonsense it is related to the Sanskrit Karmakara. But this is too strained and farfetched. Kammala is more close to the Pali word Kamma. Kammala means the one who takes on the Kamma or the ones specializing in Kamma or constructive acts or deeds. The Pali word Kamma signifies the Buddhist notion of one’s constructive good deeds and virtues that are rewarded in this world itself. 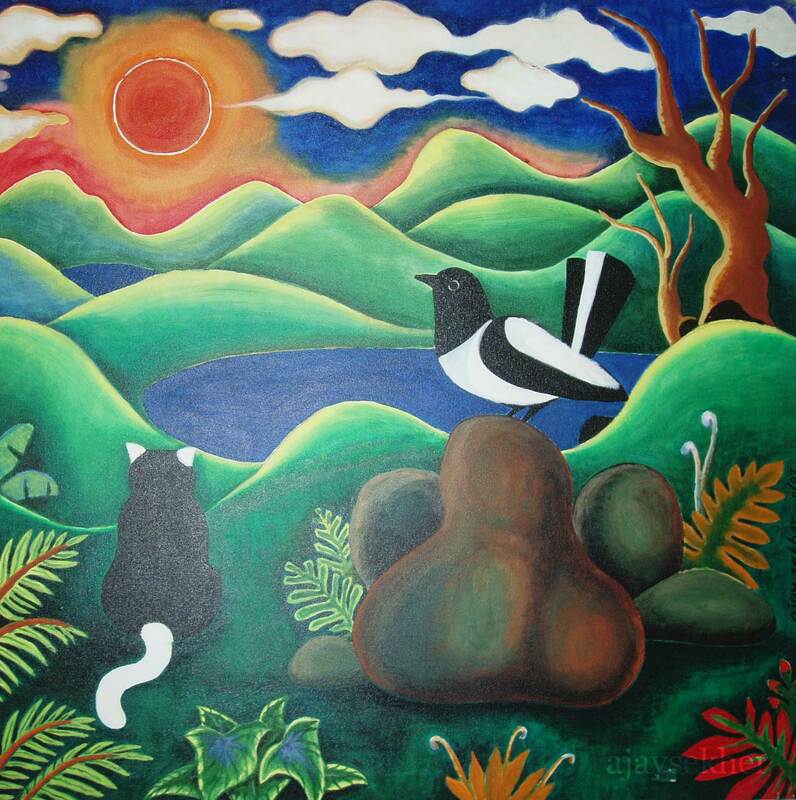 In Teravada teachings the Kamma determines your destiny. The Buddhist notion of the Kamma as epitomized in the Pali word is the proper origin of the word Kammala and these Avarna people were originally Buddhist architects or Vastu Silpis in ancient Kerala. It is also argued that the word Vastu Silpi was originally ascribed to the architects or Silpis from (Kapila)Vastu the birth place of the Buddha. This distinction between Hindu Karma and Buddhist Kamma is like the difference between Hindu Sanatana Varnasrama Dharma and Buddhist ethical Dhamma. 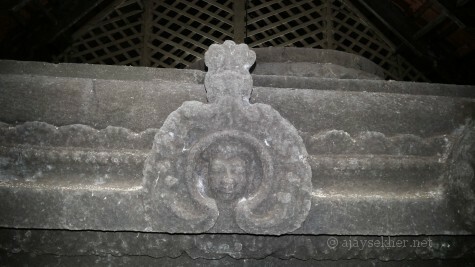 Human face within the dragon motif on the altar at Uliyanur Tevar temple. Dragon was a key Buddhist iconographic element highly popular in China, Tibet and other South Asian regions. Dragon iconography is a shared Buddhist legacy of Asia. “Vyali Mukham Vachu Teerta Valanja Vatil” says Asan in Karuna. 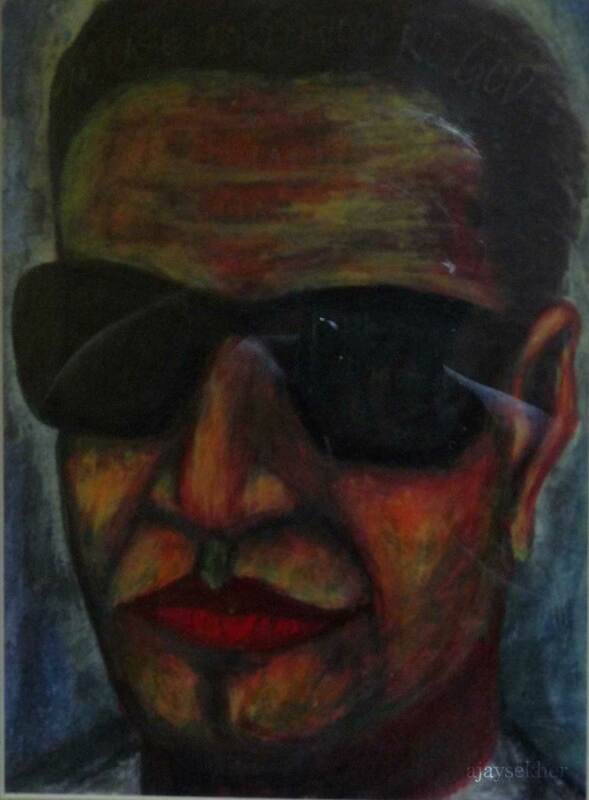 It is no wonder that the late artist M V Devan who has revolutionized the visual cultures and architecture of Kerala came down from Kannur and settled down in Aluva near Uliyanur in a home he made on the banks of the river Periyar called Choorni. It was Devan Master who reiterated and popularized the word Kammala in his speaches and writings. He always projected something that he called Kammala Samskara or enlightened artisan culture of Kerala that was sustained by the Viswakarmas and other basic working Avarna communities of Kerala. We may even call M V Devan the modern Perum Tachan for his invaluable contributions to keep alive the constructive and critical discourse on enlightened Kammala culture. Anapallam or Elephant belly swollen walls of Uliyanur temple. Another Buddhist architectural feature and a creation of Perum Tachan. In Trikoditanam such a massive elephant belly citadel is called Bhudatan Kotta. The ancient dam in Periyar is called Bhudatan Kettu. 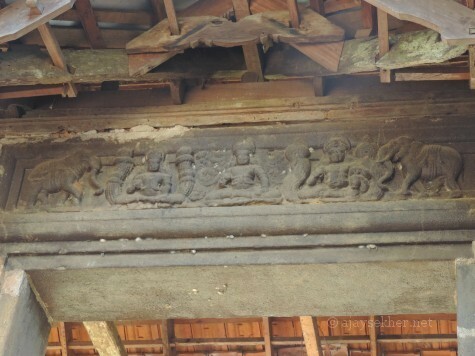 The abandoned temple in Tirunadha Puram east of Aluva is called Bhudatan temple. The word Bhuda is distortion of Budha. There are two ancient temples in Uliyanur. The older one in the south is called a Swayam Bhu or self incarnate Ganes temple that was torched in some disputes in the early middle ages, between the early priests Bhatarakas and new Nambutiri Brahmans. 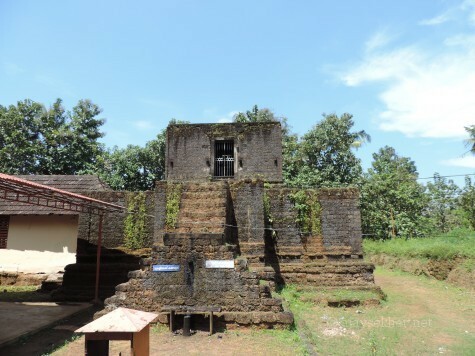 The other one is the current Siva temple or Uliyanur Tevar temple as it is called traditionally (Tevar and Matevar were originally Buddha in Kerala with its Prakrit and Pali connection to Devar) said to be the construction of Perum Tachan. It is said that the new sacred group of Nambutiris came and settled along with the Bhatarakas and later pushed them out. The gradual internal colonization of the temple by a new group of usurping priestocracy and its takeover expelling the original custodians could be recognized in this local legend. Moreover the self incarnate denomination makes it clear that the temple was existing before the Brahmanical Hindu reinstallation by Parasurama that might have happened somewhere around AD 8th century. 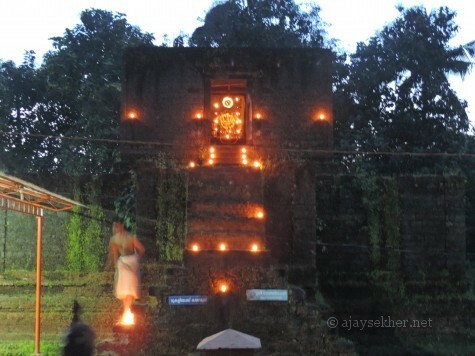 Madatil Appan shrine at Uliyanur. Madam means an elevated pagoda. Appan like Tevar denoted Jina or Buddha originally. Then Saivite and Vaishnavite shrines used it post 8th century. Only a few elevated sanctums of Madatil Appan pagodas survive in Kerala. Swayam Bhu Ganapati is facing south. The Linga was installed by Parasurama at the top as per legends. Bhattarakas were early priests. The Ganapati temple was totally demolished and lost in the fire and vandalism that followed the dispute between the ancient Bhatarakas who were the original priests and the new sect of Nambutiri Brahmans in early middle ages, say local people. The Ganes is facing south and is placed at ground level. There is another raised installation of a huge stone phallus or Linga that forms the central deity. It is called Madatil Appan now or the Lord on a high pedestal or elevated sanctum. 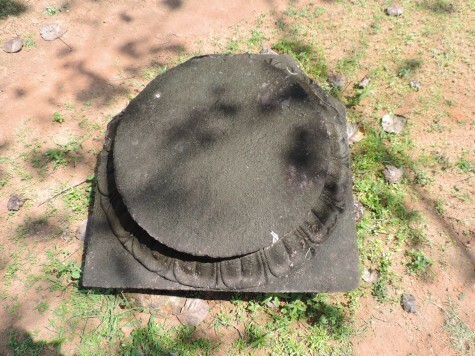 Altar top of Madatil Appan shrine. Padma Dala or lotus petal motifs engraved on it. The temple was destroyed in a fire as a result of the dispute between the Bhattarakas and Namputiris, say the people. Parasurama or the Brahman Rama with the axe, the archetypal Brahman conqueror who created Kerala with the swinging of his boomerang like axe over the Arabian Sea and established the Brahman settlements in Kerala chasing away the Naga people according to Keralolpaty and Keralamahatmyam, two 17th century Brahmanical texts, is said to have done the installation of the Siva Linga. 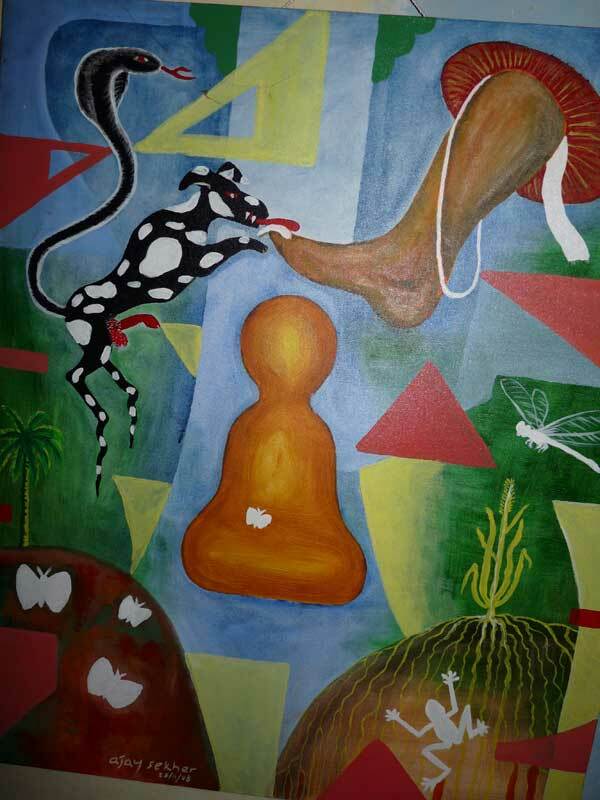 According to traditional lore it was Brahman patriarchs like Parasurama, Sankara and Vilwamangalam who installed and reinstalled the phallus or Linga in most of the current Hindu temples. Top panel of the Anavatil or Elephant Gateway at Uliyanur Tevar temple. The relief shows figures in Padmasana and elephant motifs; two key Buddhist icons. The Swayam Bhu legend, the story of the dispute between the Bhatarakas and Nambutiris, the stories of torching and vandalizing of the shrine, the reinstallation by Parasu Rama etc. prove the Amana antiquity of the shrine of Madatil Appan. There are very few Madatil Appan shrines or high up sanctums in Kerala like that of Perumanam and Parambutali in Thrissur district. The elevated Pagodas called Madatil Appan sanctums are architecturally close to ancient Buddhist temples in Kerala and in various parts of Asia. Moreover the terms Madam, Appan, Uliyan, Tachan, Tevar, Perum, Padanna etc are also non Sanskrit and Tamil and Prakrit in origin that are legacies of early Teravada Buddhism in Kerala and south India. Bhatarakas were originally the priests and caretakers of Jain Pallys or Bastis in south India. There are many place names like Pattitanam (Etumanur), Pattitara (Tritala) and Pattambi (Shornur) after the Jain Bhattarakas. 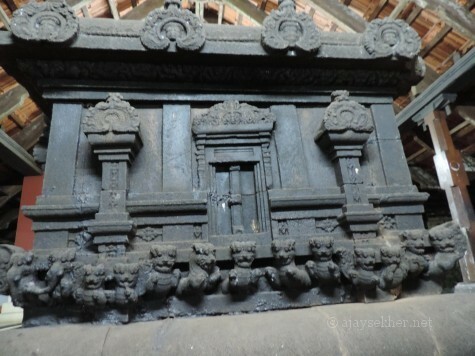 Only certain parts of the ancient Madatil Appan temple are available on the site. The top echelon of the altar or Balikallu is the only relic found. The current laterite structure is only 50 years old. Before that this destructed temple was lying like a huge heap of soil and rock, say local residents. It is possible that this Jain Pally (now Madatil Appan shrine) was totally demolished in the religious tensions and the nearby Buddhist Pally (now Uliyanur Tevar shrine) was converted into a Siva temple in the Hindu Brahmanical take over. It is likely to have Jain and Buddhist Pallys in closer proximity. They co existed all along the important cultural and trade routes in India. Just upstream towards the east of Aluva there are abandoned temples like the Bhudatan temple in Tirunadha Puram close to Tiru Airanikulam. There are places like Sri Bhuda Puram near Tiru Airanikulam. Place names and architectural patterns suggest a strong Buddhist cultural heritage. The author with Dr Aju K Narayanan (left) and Mr Vivek the younger member in the Perum Tachan family at Uliyanur before Perum Padanna house. The Siva temple in Uliyanur towards the north of Madatil Appan shrine, has a circular sanctum or Vatta Srikovil. Vattams are found only in Kerala and Ceylon and have given birth to ancient place names all over Kerala like Palarivattam, Naduvattams (several) or Villorvattam. Vattam is called Vatta Dage in Ceylon. Its Anavatils or Elephant Gateways on the east and west and Anapallam walls or Elephant Belly swollen compound walls (like the swelling Buddha-belly bamboo) are also Buddhist architectural reminiscences in Kerala. The ancient altar with lion and elephant motifs and dragon faces that are found all over Asia are also key Buddhist architectural relics. 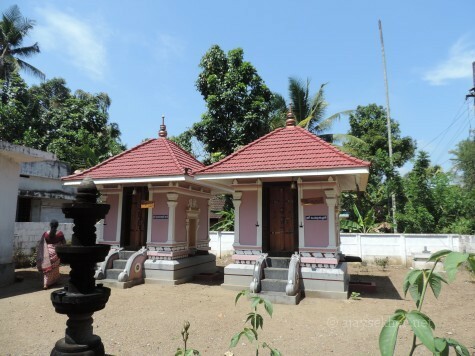 Pagodas in which Perum Tachan (right) and Bhuvaneswari Devi are enshrined at Uliyanur Perum Padanna household also called Asari Parambu. The Vatta sanctum with 68 heavy wooden beams converging into a single dome wooden pagoda top structure is said to be a unique creation of Perum Tachan. No other Tachan in Kerala history is able to deconstruct it or duplicate it so far. This type of labyrinthine wood ensemble is not even mentioned in the 16th or 17th century Brahmanical architectural texts like Tantra Samuchayam and Manushyalaya Chandrika that form the foundations of Hindu temple architecture in the Brahmanic period after the middle ages. This fact itself proves that the architectural practice is much ancient than the Hindu Brahmanical temple culture that was established only post 8th century. 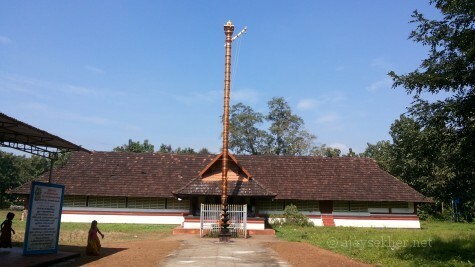 Madatil Appan shrine at Uliyanur. 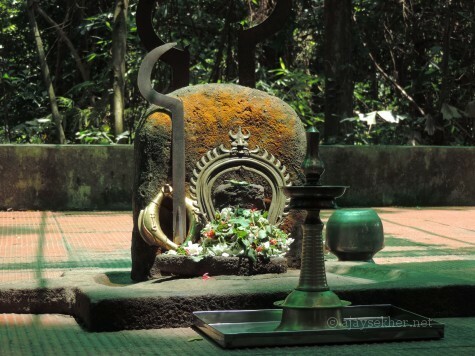 The Linga was installed by Parasurama according to legend. 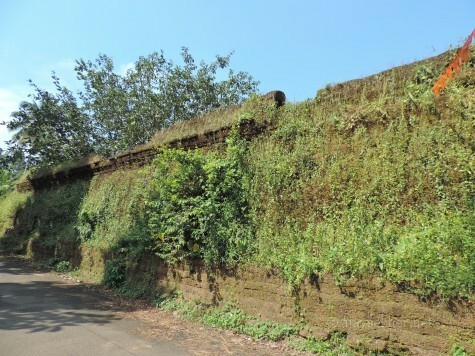 The current laterite structures were constructed some 50 years ago. Perumanam and Parambutali in Thrissur district have Madams. 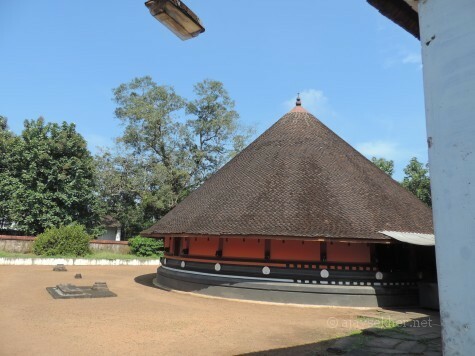 Uliyanur Perum Tachan is now enshrined in a tiny pagoda along with Bhuvaneswari Devi in the Perum Padanna household in Uliyanur towards the south west of the temple. The family till recently held traditional rights in the temple festival. But with the erection of a concrete flag post or Kodimaram that long legacy is also taken away from them. 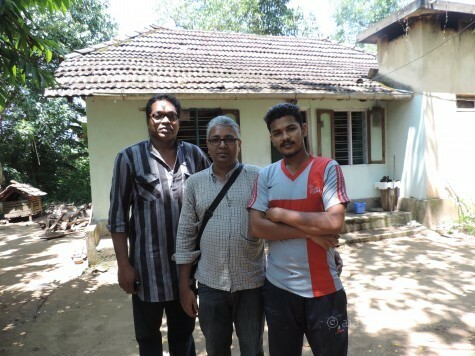 It is clear that this household that gave birth to stalwarts like Perum Tachan is part of an ancient architectural legacy of Buddhism in Kerala. Uliyanur Tevar temple an exquisite creation of the great Tachan of Uliyanur in early middle ages; a view from east. The new metal covered concrete flag post that terminated the traditional rights of the Perum Tachan family in front. Chungath, Rajan. Perumtachan Dukhitananu. 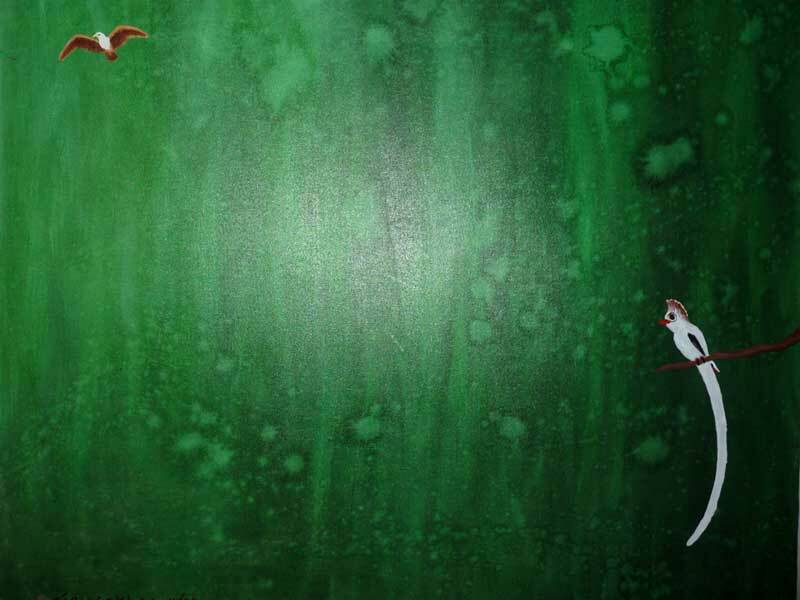 Thrissur: Green Books, 2011. This entry was posted in Cultural Politics and tagged Avarnas in Kerala and Buddhism, Buddhist architecture in Kerala, Buddhist Vastu Silpi, Jain and Buddhist architectural motifs in Kerala, Kammala and Viswakarma, Karmakara and Kammala, Kerala and Sri Lanka, Kerala temple architecture and Buddhism, Madatil Appan shrines in Kerala, Madatilappan, Perum Tachan, Perumthachan, Uliyannur, Uliyanur, Vastu Silpi and Kapila Vastu, Vatta Dage in Kerala, Vatta Srikovils in Kerala, Vattam, Viswakarama community on October 13, 2014 by Ajay. ചരിത്രകുതുകികള്‍ എഴുതിയ പുസ്തകങ്ങളായിരുന്നു പ്രധാന ഉപാദാനങ്ങള്‍. അവയില്‍ ഒരു വിഭാഗം ബ്രാഹ്മണ്യവുമായി വിശ്വകര്‍മ്മജരെ കൂട്ടിയിണക്കുന്നതാണ്. ബ്രാഹ്മണര്‍ പില്‍ക്കാലത്തു നശിപ്പിച്ചുകളഞ്ഞുവെന്നും വാദിക്കുന്നു. എന്തായാലും ആകെ കലങ്ങിമറിഞ്ഞു കിടക്കുന്ന സങ്കീര്‍ണ്ണ ഘടനകളാണു വിശ്വകര്‍മ്മ ചരിത്രത്തിനുള്ളത്. ഓരേ സമയം സവര്‍ണ്ണതയും അവര്‍ണ്ണതയും പേറുന്ന സന്ദിഗ്ദ്ധാവസ്ഥയിലാണു വിശ്വകര്‍മ്മ സ്വത്വം. നോര്‍വേയിലെ ഒരു സര്‍വകലാശാലയില്‍ ഗവേഷണം നടത്തിയ ജോര്‍ജ് വര്‍ഗീസിന്റെ ഗവേഷണപഠനം ഇതു ശരിവയ്ക്കുന്നു (സ്വര്‍ണ്ണകേരളം, ഡി.സി.ബുക്‌സ്). ഏ.ഡി.8-ാം നൂറ്റാണ്ടിനു ശേഷം ബ്രാഹ്മണക്ഷേത്രനിര്‍മ്മിതികളുമായി ഐക്യപ്പെട്ടുനില്‍ക്കുന്ന വിശ്വകര്‍മ്മജര്‍ അതിനു മുമ്പ് ആരായിരുന്നു, അവരുടെ മതസ്വത്വം എന്തായിരുന്നു എന്നീ ചോദ്യങ്ങള്‍ പ്രബലമാണ്. കേരളത്തിലുണ്ടായിരുന്ന (ഇപ്പോഴും നിലവിലുള്ള) ബുദ്ധ-ജൈനപ്രതിമകളും ചൈത്യങ്ങളും മറ്റും നിര്‍മ്മിച്ചതാരാണ് എന്നു ചോദിച്ചുതുടങ്ങിയാല്‍ അന്വേഷണത്തിന് ഒരു വഴി തെളിഞ്ഞുകിട്ടും. ഈ സന്ദര്‍ഭത്തിലാണ് ഞാനും അജയ് ശേഖറും കൂടി ഉളിയന്നൂര്‍ സന്ദര്‍ശിക്കുന്നത്. ഇവിടുത്തെ വിശ്വകര്‍മ്മജരുടെയിടയില്‍ പരമ്പരാഗതമായി നിലനില്‍ക്കുന്ന ചില നാടോടിക്കഥകള്‍ /നാടന്‍ ആഖ്യാനങ്ങള്‍ ഞങ്ങള്‍ക്കു ലഭ്യമായി. ഇവ കൂടാതെ, പെരുന്തച്ചന്‍ നിര്‍മ്മിച്ചതായി കരുതപ്പെടുന്ന ഉളിയന്നൂര്‍ ക്ഷേത്രത്തിലെ ചില ദാരു /ശാലാ ബിംബങ്ങളും ചരിത്രത്തിലേക്കുള്ള ചില താക്കോലുകളാണ്. ഇതിലേക്കുള്ള അന്വേഷണം സാംസ്‌കാരിക-രാഷ്ട്രീയ പ്രവര്‍ത്തനമാണ്.